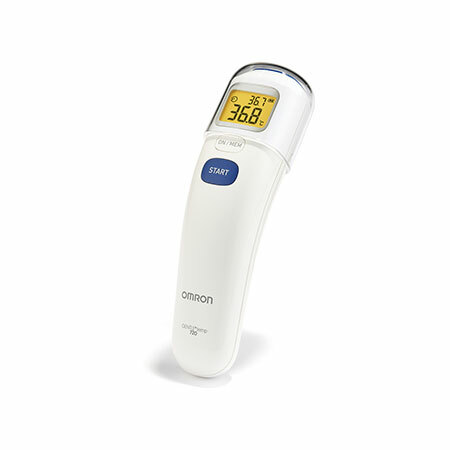 With OMRON’s expertise applied to a thermometer, the Gentle Temp 720 measures forehead body temperature with no contact in the most accurate way. The Gentle Temp 720 measures forehead temperature, but can also be used to take surface temperatures, from a milk bottle or food dispenser for example, as well as giving readings for the room temperature. After all, why use three thermometers when one can do everything? With a memory capable of recording up to 25 readings, it’s possible to track temperature changes over a period of time and monitor trends. Temperatures can be displayed on the large LCD display in either degrees Centigrade or Fahrenheit. The new Gentle Temp 720 readings can be seen clearly at nighttime, making it especially handy when measuring your baby’s temperature at night.